A patient in a vegetative state can communicate just through using her thoughts, according to research. A UK/Belgium team studied a 23-year-old woman who had suffered a severe brain injury in a road accident, which left her apparently unable to communicate. By scanning her brain, they discovered she could understand spoken commands and even imagine playing tennis. They said their findings, published in Science, were "startling", but cautioned this could be a one-off case. Five months after her accident, which happened in July 2005, the researchers used functional magnetic resonance imaging (FMRI) to record the woman's brain activity. She was diagnosed as being in a vegetative state, which meant even when she was awake, she was unresponsive. While her brain was being mapped, the researchers asked her to imagine simple tasks, such as walking around her home and playing tennis. 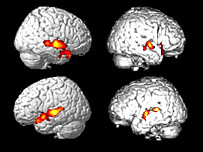 Lead scientist Dr Adrian Owen, a neuroscientist from the Medical Research Council's Cognition and Brain Sciences Unit in Cambridge, said: "The tasks we chose are based on many years of brain imaging research that shows different areas of the brain are activated when we perform different kinds of tasks." When the scientists compared her brain activity to that of healthy patients, who had been asked to carry out the same task, they discovered the patterns were "indistinguishable". Dr Owen said: "These are startling results. "It tells us the patient could understand speech, because of course, we asked her to do these things. It also tells us that she is able to perform simple tasks in her head, such as imagining certain scenarios. "We see this as a proof of principle: we have found a way to show that a patient is aware when existing clinical methods have been unable to provide that information." However, he emphasised that this was a single case and people should not assume all patients in a vegetative state were consciously aware. He said: "All vegetative patients are different: they have damage to different parts of their brains and their chances of recovery are different." In an accompanying article in the same journal, Lionel Naccache, of the Cognitive Neuroimaging Unit in France, said: "Despite the woman's very poor behavioural status, the FMRI findings indicate this existence of a rich mental life." He said there was a strong case for assessing other patients using this scanning technique, but he added that it was important not to generalise from one patient. The finding that vegetative patients may experience awareness of their surroundings will fuel the ethical and legal arguments that surround some vegetative state cases. Last year, a debate raged in America over whether 40-year-old persistent vegetative state patient Terri Schiavo should be allowed to live or die. 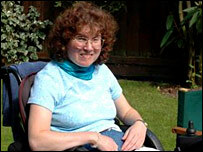 Eventually, following a court decision, her feeding tube was removed on 18 March and she died 13 days later. Kate Bainbridge, who was initially diagnosed as being in a vegetative state, but who has since recovered and can communicate through a keyboard, said the scanning work was very important. She took part in some scanning experiments from the same team. She said: "I can remember when I couldn't respond and it was so scary." She added that doctors should never assume that a patient is not aware.